Blog Quick Quotes: July Club Q Inspiration with Donna! July Club Q Inspiration with Donna! Greetings from Donna! I'm hosting the blog today and featuring the July Club Q. 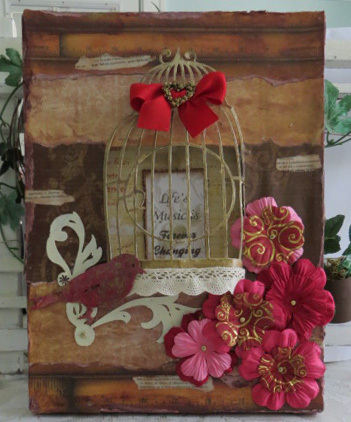 Today I would like to show you a canvas I made with Quick Quotes Club Q Altered July kits. These kits are so packed with fun laser cut die-cuts that the possibilities for these kits are endless. There are instructions but if you're like me I like to toss them aside, pull everything out of the kits and see what I can create with it, and this is what I came up with. I decided to tear some paper and layer it. I also inked the edges of the frame with Quick Quotes Mocha Mama Powderpuff Ink. Finally before putting a layer of ModPodge on I added some word definitions from an old dictionary. If you look closely they say love, music, harmony, also brushing them with a wash of diluted paint. For the birdcage I put a thin layer of gesso and then coated it with a thin layer of gold. I used the reverse side of the canvas so I could leave a hole in which I bent the bird slightly to fit the hole I left behind. For the bird I used Quick Quotes Red hot Powderpuff ink and added some gold highlights. Before applying Modpodge, the edges where I ripped were white and I wanted them to look more vintage. So what I did was dip a paintbrush into brown paint, and then swoosh my brush around in a little bit of water to give me a wash, I then proceeded to put a layer of watered down paint all over the paper and I love how it created this effect on the edges. Thanks for visiting Quick Quotes, be sure to check out the Club Q kits this month, if you haven't already. I like how you treated the edges of the torn paper. Thanks for sharing. Gorgeous canvas Donna!!! Love it. Gorgeous canvas! I love the gilded cage and the pretty pink flowers!